A Light Bulb That Eliminates Odor? 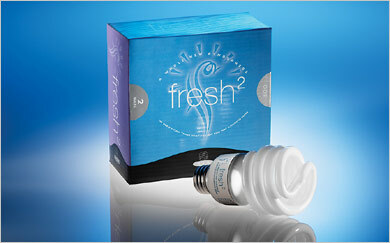 That’s right, you saw it here first… The Fresh2 is an odor-eliminating compact fluorescent light bulb. A special coating of titanium dioxide is what gives Fresh2 the ability to break down odors. They dip the glass part of the bulb into titanium dioxide, which forms a thin transparent film. When the surface of this coating is exposed to fluorescent light a photocatalytic action occurs. Now that’s science at its best! The reaction emits negatively charged particles and positively charged holes form in their place on the glass surface. This creates very strong oxidizers that completely break down odors and begins to work 10 minutes after the bulb is turned on. The odor-eliminating power of Fresh2 should last about three years and it uses 75% less energy than standard bulbs and generates only one-tenth of the heat. A package of two 23-watt (comparable to 100-watt incandescent bulbs) Fresh2 bulbs will cost you about $20.